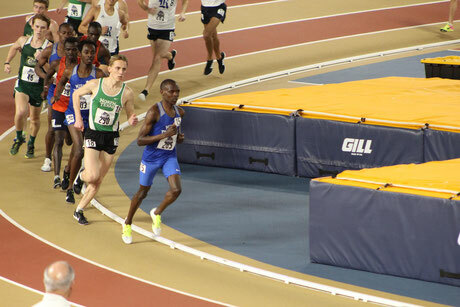 Satisfying weekend at C-USA Indoor Championships with a 5000m, 3000m - double. The championship weekend started with the 5000m on Saturday evening. The race was over 25 laps, since indoor tracks are just 200m. Thankfully, the sharp turns of the track in Birmingham are banked, which makes it way more comfortable to run at. The start of the race went perfectly for me and I found myself in third position after the first lap. The kilometer splits were really consistent but in between there were several paces changes. I was able to follow the favorites in the first 15 laps but after that I was more focused on maintaining the pace. I finished the race in 14:37.09 in 5th position. This means I was just 9 seconds of my personal outdoor record and was able to win valuable points for the team. After crossing the line, the main focus switched to recovery because just 20 hours after the 5000m, I was scheduled to race the 3000m. After a short and restless sleep I was surprised how good my legs feel. I expected them to be pretty sore after getting up but it seems like I barely ran the day before. Since I was just seeded in 13th position, I had to start the 3000m in the the slower heat. This wasn't really bad because both heats will be combined by time, which means that it was still possible to finish in the top eight overall, to score more points. Several teams in my heat had the same goal and following that there were several guys ready to set a fast pace. Even with the fast pace, the first part of the race was hectic since many guys tried to run in the front positions. I ran in the mid part of the lead group and started to feel my tired legs a little bit. Luckily, I was able to accept the legs and just go for it. I started to overtake guy after guy and with a few laps to go I was in second position. I finished the race in that place and set a new personal record in 8:25.39. In the faster heat there were six guy able to run a little faster than I did which made me finish in eight position. This added one more point to my teams total. Looking back, I am definitely satisfied with this weekend. I didn't expect that I could come back so well in my second race and would be even able to set a new personal record. Through this two solid times, I am really confident for my outdoor season. I will have now several weeks of training coming up to improve my shape further.